Hayo Baan's Photography Blog: What is the best memory card for you? What is the best memory card for you? First there's size to consider. Bigger is better, right? Well, not particularly. The problem with a bigger card is that if something goes wrong (e.g., the card breaks, you accidentally format the card, etc.) with the card, you potentially lose more pictures. Recovery will be harder (and definitely take longer) as well. So smaller is better then? Well, again, not particularly. Chances of one or more cards failing out of a number of cards is much higher than the chance of an individual card breaking (in fact even more than the number of cards times higher). Luckily chances of a card actually breaking are pretty minute (as long as you stick with the major, reputed, brands). The size of your average session will of course vary and depends heavily on number of shots, resolution (mega pixels) of camera, whether or not you shoot JPG or raw, etc. If you shoot video (frequently), be sure to take this fact into account when deciding on card size as well! So now you know the size of the card that would be “ideal” for you, should you buy one, two, or ten? Well, this depends; I always bring some sort of storage device with me (two in fact, one for backup) and offload the images each day. The cards are then formatted (in camera) and ready for use the next day. This means I only need one session worth of storage capacity (plus some additional spare space for if the session suddenly gets bigger). If you don't have the means to offload your images, you'll need to buy more cards, at least enough to last you until you can offload them again. You'll also need to buy multiple cards if you do offload them, but want to keep the card as extra backup (e.g., until you can properly back them up at home). So in short: get a memory card the size of your expected shooting session, and get as many as you need to last until you can safely offload them. Use older/smaller sized cards as emergency storage for when you run out anyway. Note instead of getting multiple cards, you could of course also buy a single larger card, but remember the risk involved with choosing this way. Economics may drive this decision too; larger cards may or may not be more expensive than multiple smaller cards. How quickly your camera can write to the card – This determines how quickly you can shoot bursts of images consecutively, and for how long. Each camera has an internal buffer that fills up at the maximum frame rate of your camera, but once that buffer is full frame rate drops to the speed at which your camera can write the images to the card. So if you frequently shoot burst of images (e.g., with sports, action, and wildlife), a faster card may be an advantage to you. If on the other hand you shoot “slow” (e.g., landscape, architecture), a faster card doesn't really hold any benefit for you here. The problem is, a faster spec'd card may not necessarily be faster in your situation at all. Actual speed depends on the particular combination of card technology (XQD, CF, SD), card type, card size, camera, and card reader. For instance, taking a SanDisk Extreme IV 8GB card, my D3 is capable of writing at a rate of 24.4MB/s to it. The new Canon 5D III on the other hand is capable of writing at the much faster rate of 34.2MB/s. A card that is the fastest for one type of card reader may not be the fastest for another, etc. 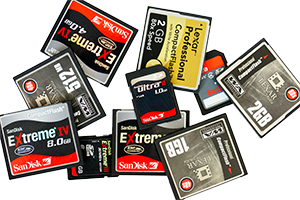 Generally speaking, Compact Flash (CF) cards are faster than Secure Digital (SD) cards. The new XQD cards, introduced with the Nikon D4, are faster again, beating even the fastest CF card by a margin. Deciding on card technology therefore can be important if your camera supports two types of cards. To help you decide which card or reader to get, have a look at the XQD/CF/SD Performance Database as maintained by Rob Galbraith. It contains data for many popular Canon and Nikon cameras. Please note that Rob Galbraith is no longer maintaining the database. Even though, it still provides valuable input for the card selection process. I completely agree with you and thanks a lot for sharing this useful information with us..